The award winning Vergic Engage Platform allows businesses to proactively engage with their web visitors in real time and seamlessly switch between Live Chat, Video, Voip or Phone. The integrated co-browsing functionality lets you leverage on both existing web content, web processes as well as other specifically tailored content creating a highly personalised customer experience in every customer interaction. 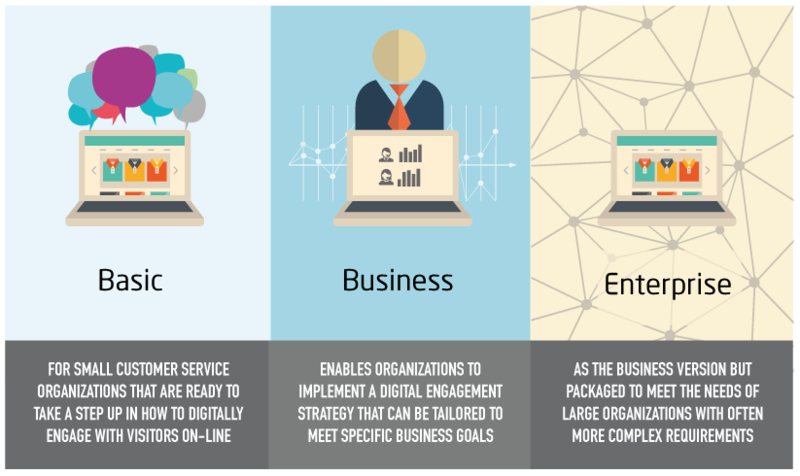 Vergic Engage Platform comes in three versions, Basic, Business and Enterprise. The three versions are tailored to give any organisation with the need to meet and engage with customers and visitors on-line the opportunity to use Vergic Engage, no matter of size or type of business. Our world leading Digital Engagement platform comes in three different versions. Vergic Engage Basic is a scaled down but still feature rich version of Vergic Engage Business and Enterprise. The Business and Enterprise versions basically offers the same functionality but with the Business version in a package tailored for the smaller organisations. The Enterprise version is tailored for larger organisations with a multi channel approach to sales support and customer service. Use text chat to interact with your customers. Combine the co-browsing functionality with text chat as well as phone to collaborate with all your customers on all devices with no installation. Compare prices and features on this page.